Dimensions: XS: 8" x 8" x 4"; Small: 10" x 8" x 4"; Medium: 11" x 8.5" x 4"; Large: 12" x 8.5" x 4"
Weight: XS: 1 lb. ; Small: 1.1 lbs. ; Medium: 1.2 lbs. ; Large: 1.3 lbs. Not only did you come through with a second pair( no charge) after my first pair got lost in the mail, but you sent me the most comfortable slippers I’ve ever had. Easy to slip into,no worries about steps outside in them, because they have a non slip rubber sole. I’m a big fan. They are heavenly. So comfortable and soft! Now I don’t have to put shoes on to walk my dog, these can be used outdoors. These slippers have good arch support for a slipper at this price point. I’ve had slippers that were much more expensive that had no arch support, didn’t fit as well, and weren’t as warm. It’s great that such a lightweight slipper can keep my feet warm. I have Reynaud’s syndrome which means cold feet most of the time, but these slippers help. These slippers are super comfy, roomy but still stay put on the feet when walking. Also, very well made. 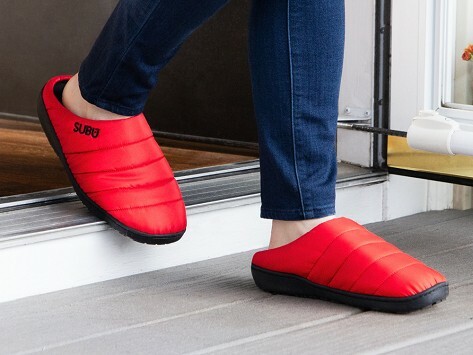 SUBU slipper shoes will be your go-to choice to warm feet from the sofa to the street. Designed in Japan, where being barefoot inside is customary but not always convenient for outside errands, these indoor-outdoor puffy slippers offer the ease of slip-on sandals with plush warmth for colder weather. A four-layered insole keeps things cushioned, comfortable, and supportive inside the slippers, while Teflon™-coated nylon outside repels water and dries quickly. Non-slip rubber soles keep you on solid footing for jaunts to the mailbox, a bus stop run, or a quick walk with the dog—no socks required.